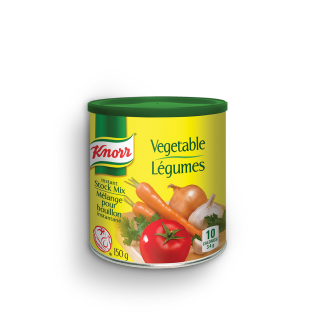 Knorr Vegetable Instant Stock Mix adds great flavour to your cooking with a savoury blend of vegetables and seasonings. Corn syrup solids, salt, hydrolyzed soy/corn protein, monosodium glutamate, natural flavour, dried vegetables (tomatoes, onions, carrots, garlic), canola oil, tricalcium phosphate, colour, herb & spices, dried parsley, disodium guanylate, disodium inosinate, wheat maltodextrin, silicon dioxide, corn starch, colour, and sulphites. May contain traces of milk ingredients.